Card-carrying Communist Frank Marshall Davis: Did he really carry a card? Anti-Obama conspiracy theorists are shipping DVDs of the film Dreams From My Real Father to swing states with funding from a mysterious donor. The documentary claims that Obama was secretly sired by Frank Marshall Davis, who theorists allege was “a literal card-carrying communist.” Do Communists really carry cards? Not anymore. During the Cold War, most American Communists did not carry around cards certifying their membership in the Communist Party, but some prominent members did. While others would keep their records secret at headquarters or at a local chapter, these party and union leaders would carry their cards with them. As labor activist William McCuistion testified when asked to explain the phrase at a House Committee on Un-American Activities hearing in 1939, the “ ‘card-carrying Communist’ is the type of Communist who comes out and admits to everybody he is a Communist. … He flashes it to everybody, just like a reporter flashes his credentials at this thing here.” Some such cards were produced by HUAC investigators during the Second Red Scare. 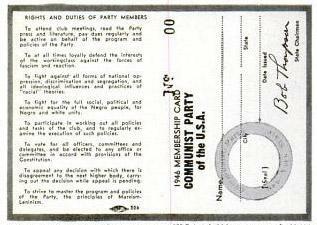 One card was even printed in a July 1946 article in Life magazine: It read “Membership Card” and “Communist Party of the U.S.A.” alongside the holder’s name and the “Rights and Duties of Party Members.” The magazine suggested that the card was “held by approximately 65,000 Americans.” However, the cards produced by the committee were not usually plucked straight from the pockets of Communist Party members. Instead, the FBI had broken into Communist Party headquarters and taken photostatic copies of their records, and the committee produced the documents without revealing their source. Before Communists, the first “card-carrying” groups tended to be members of labor unions, and often members used the cards openly to claim union jobs. Perhaps the earliest mention of “card-carrying” union members came in a 1912 Daily People article, which described how “ ‘Union-card’ carrying members” of certain labor unions were occasionally able to get elected to Congress. A 1918 New York Tribune article described members of the Industrial Workers of the World as “red-card-carrying ‘wobblies,’ ” referring to the members by their popular nickname and red membership cards. In 1927, all “card-carrying members” of the secret organization United Farmers reportedly received discounts from local merchants. 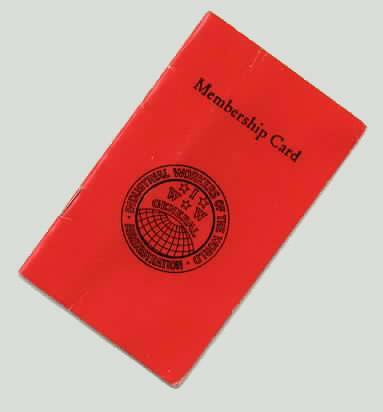 The current Communist Party USA no longer issues membership cards, and a spokesman told the Explainer that “like most other organizations that once had cards, dues, stamp books and such, we have entered the digital era.” Those who wish to become “card-carrying” members today can pay dues and register online. Explainer thanks Ellen Schrecker of Yeshiva University and Ben Zimmer of the Visual Thesaurus and Vocabulary.com.